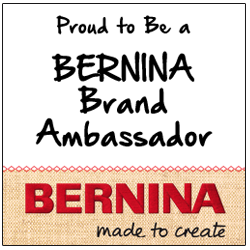 Thank you for visiting my website! Happy New Year to all my quilting friends. It was a very busy and successful 2018. Thank you to all the great helpers I had at my classes this fall with my broken foot limitations! My foot is healing and I am doing great. I look forward to seeing many of you this year at the many quilting events I have scheduled. I will be updating my workshops and lecture pages in 2019- so please take a look at my new offerings soon. A very popular class this past year has been rulerwork on the home sewing machine and I will be including 2 rulerwork classes with these updates! The 5th Annual Holly Girls Quilt Retreat was a great success! We had 4 beautiful weeks at White Birch Lodge with enthusiastic quilters who created wonderful "Trip Around the World" projects. Please go to the 2019 Retreat Tab for detailed information on this years retreat theme and registration information. As of January 25, all four weeks of our retreats are full. We typically get a few cancellations in June and July, so please contact us now if you are interested in attending and we will add your name to our waiting list! I am teaching on the "Quilt Seminars at Sea" cruise from San Diego to Hawaii in February, 2019. This is a very popular cruise and spots are filling fast. I am also teaching on a 2nd cruise in 2019- The Northern Isles Cruise in May will begin in Copenhagen and we will visit Scotland, Ireland, France, Amsterdam, Brussels and Oslo! I am also happy to announce that I will be teaching on "The New Zealand Explorer" in January of 2020- this will be a trip of lifetime for me. I hope you will join me on one these exciting cruises!!! Please go to www.quiltcruises.com to find out more information on these cruises. I am now booking for 2020! Please let me know if your group has scheduled me to teach and you don't see it entered on my updated schedule. Please note, I will be updating my schedule soon to add many dates. 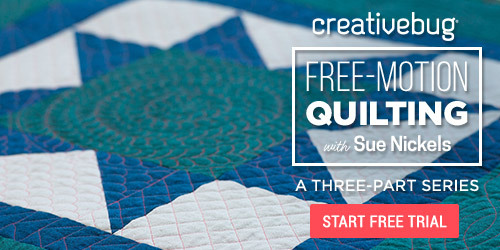 I am pleased to announce my latest Creativebug class, Free Motion Quilting, has just come out. In this three part class I'll show you how to transfer a traditional Amish quilt top using free-motion quilting techniques. If you are new to Creativebug you can get a free 30-day trial when you sign up and use code: SUE. Sign up for my class here. 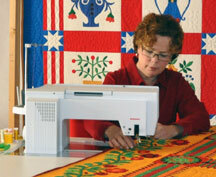 In Part 1, you will learn how to design your own quilting patterns and create custom templates. Using an already-pieced quilt top, I'll demonstrate how to create a design concept and sketch patterns. All of the basics are covered here, including how to design patterns using rulers, how to cut out your own template plastic, and how to create a cable pattern using a paper folding technique. I'll also shows you how to draw my signature feather motif and turn it into a circular template. Once you have completed this class, you will be ready to move on to marking your quilt. Once you have designed your quilting motif, the next step is to mark your quilt top. I teach several methods for transferring your pattern to fabric, including tracing patterns using a lightbox, freehand drawing, tracing plastic templates and using rulers as guides to create geometric patterns. Finally, I'll cover basting your quilt sandwich to prepare it for machine quilting. Now for the fun part-machine quilting! In this part I teach you all about the quilting process. You'll learn how to work with a large quilt and use free-motion quilting techniques to create feathers, straight-line geometric shapes, scallops, and cables. 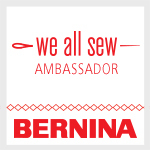 You will be amazed at what you can do with a sewing machine and a darning foot. 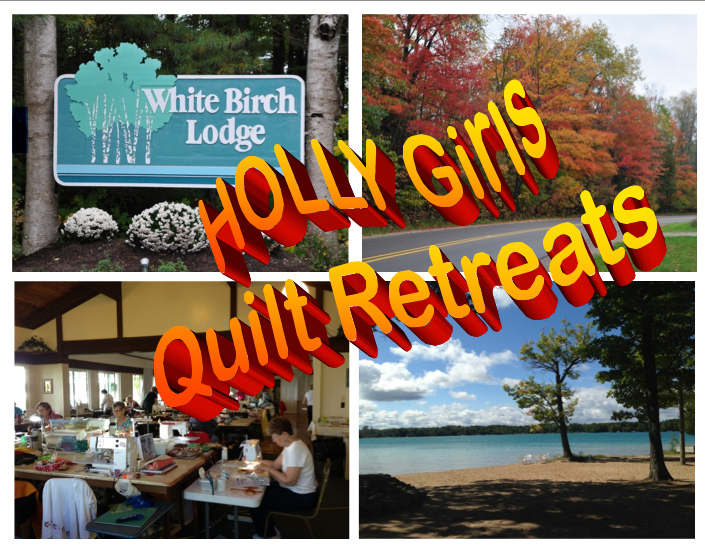 5th annual Holly Girls Quilt Retreats information: The retreats are held at the lovely 100 year old White Birch Lodge. Nestled in the woods along the shores of Elk Lake, you will be right in the heart of Northern Michigan's resort area. The town of Elk Rapids is a charming small town with nice restaurants and shopping. The topic for 2018 is "Trip Around the World". My sister, Pat Holly, and I are excited to continue the tradition our good friend Gwen Marston started with her Beaver Island Quilt Retreats over 30 years ago. Please go to the Retreat Tab to find out more. we hope to see you in beautiful northern Michigan next fall! 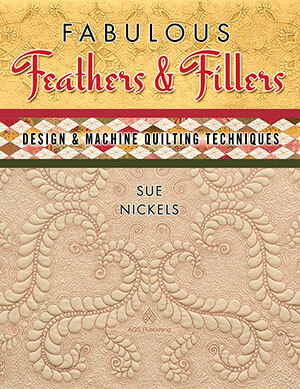 I am pleased that my book, "Fabulous Feathers & Fillers", is still available. Please go to my store to order. My sister, Pat Holly and I are thrilled to announce that our quilt "Two of Us" won Best Home Machine Workmanship at the 2014 American Quilters Society Show in Paducah. 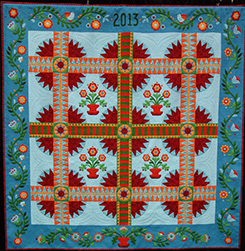 The quilt was the 2013 Block of the Month on The Quilt Show.com with Ricky Tims and Alex Anderson. The quilt will now be part of the permanent collection of the National Quilt Museum in Paducah, Kentucky. My blog is on a hiatus- I am hoping later this year to have time to revive it! My workshops page will be updated soon and I hope to add a few new workshops and reitre a few old ones. Please check these out and if you have any questions let me know. My supply lists are also up to date. I have included information on the workshops page for students and groups to help make your workshop experience the best. Please read this helpful information section with my workshops! My biography and fees and requirements have minor updates. I continue to use a camera and projector in the classroom for demos and it is a fabulous teaching aid. Because of this I have a few extra requirements in the classroom, please be sure to read this under classroom requirements. I have achieved my goal of having my lectures in power point. So for all my lectures, I will bring my own projector and computer and present my images using power point! My Store has a few of my books- AQS has stopped publishing and I have just a linited number of my machine quilting books avaialble. My patterns are still available. I also carry some of the quilting items I use and sell when I am on the road teaching. My thread line- King Tut “Tone on Tones” from Superior Threads is available from- www.SuperiorThreads.com. I am not currently selling these threads on my website. I am still using a paper backed fusible web product called Soft Fuse from Shades Textiles for my technique of machine appliqué and I am selling this at my website store. I love this product- it is easy to use and never separates from the paper!!! My favorite marking pencil- Quilter Choice by Roxanne’s is for sale with the pencil sharpener that works best with it. I have also added to the store my favorite small scissors that I use for appliqué. Please visit my Gallery of Quilts page which features a sampling of my quilts. I have the quilt my sister, Pat Holly and I collaborated on called “Tea at Tenby”. 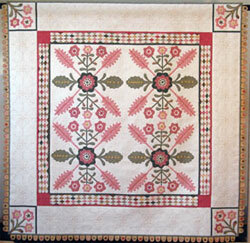 It won many awards - the most exciting was “Best of Show” at the 2009 Festival of Quilts in Birmingham England! I have included information about some of our other award winning quilts- “The Beatles Quilt” and “The Space Quilt” as I am often asked to explain the details of these collaborative quilts. My sister, Pat has been creating beautiful miniature quilts- look for her page in the “Gallery of Quilts” that showcases some of her work. I am working on my next goal of creating new quilts in the next year, so look for these soon! I am enjoying being a Grandma! My granddaughter, Stella is 7 years old and our granddaughter Mabel is 4 years old! I will soon have new classroom and travel photos in my travel photos.